Welcome to JPRWebs - Website design and development company in jaipur. 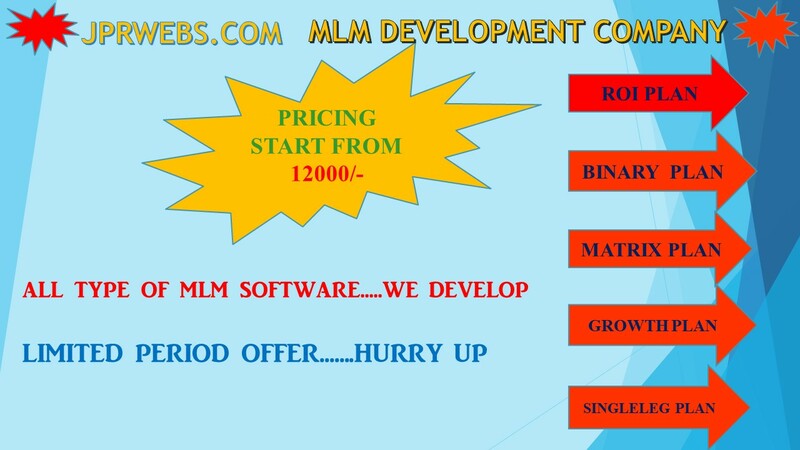 MLM industry works on various plans and concepts to sale products or services by team efforts. JPRWebs have a qualified team of MLM consultants, web designers, software developers, support and software testers who have years of experience in the MLM Software consultancy, design and development to approach the domestic and International MLM networkers and customers. The team is ready for implement your ideas and new MLM concepts into MLM Software. Single Leg plan is mostly use by the MLM business Or MLM company because it is easy to understand by a common man. Matrix Plan use by those MLM Company which have the powerful Network or powerful team leader. In this plan MLM Company make our team leader to sell the E-PIN or Product Repurchasing. MLM Help, Gift are the latest running plan in MLM industry. Help someone to get more help from others. Growth Plan is one of the oldest plan in the MLM Industry. As the name suggests Growth plan is dependent on the Growth of the MLM company. Mobile Recharge MLM Plan is the new concept in MLM industry in which every MLM leader join the plan to get a Mobile Recharge distributorship.